The iPhone is definitely one of the most sought after mobile phones in the market today, and it is also one of the most expensive. In most parts of the world, unless you get the iPhone linked to a telecomm provider contract, the price of the phone can be rather ridiculous. Then again, it does serve as more than a phone, so many people consider the price worth it. When it comes to buying expensive gadgets, it is also worth purchasing accessories that will help protect the gadgets from normal wear and tear. The iPhone 4 is no different. And if you are looking for an iPhone 4 case, here is an excellent choice: the BookBook iPhone 4 Case. There is no dearth of iPhone 4 cases in the market – that is for sure. From plastic cases to leather cases to rubber cases – you can find practically any kind at a wide range of prices. If you want to go for the vintage look, though, the BookBook iPhone 4 Case is perfect. As you can see in the image above, the leather is worn beautifully, making it look as if your grandfather had used it lovingly for ages. If you are a bookworm, this case will appeal to you even more. The BookBook iPhone 4 Case is more than a phone case, though, and this is what really appeals to me. Taking a look at the image above, you can see that there the BookBook iPhone 4 Case has pockets for other important stuff – things that you would normally put in your wallet. 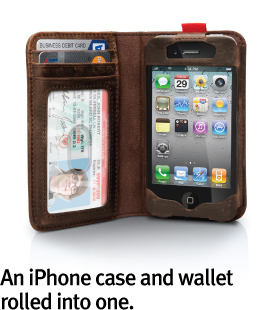 As such, this iPhone 4 case doubles as a wallet! This is actually exactly what I have been looking for. If you think about it, when you do not want to have much with you when you go out, the two items that you will most likely carry is your phone and your wallet. Now if you can put them together, that would just be perfect! And that is exactly what the BookBook iPhone 4 Case does. This iPhone 4 case is being sold by TwelveSouth for $59.99, which is a very competitive price. If you are in the US, you are in luck as they offer free shipping.